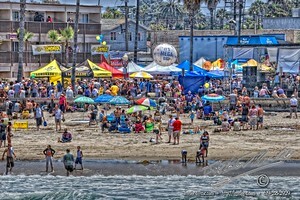 This is what the Ocean Beach Street Fair looks like from the end of the Ocean Beach Pier, looking inland. This day was wonderfully warm, but not hot. And we were at the beach, which is a nice place to be. The day of the street fair was the kind of Southern California days we think are year-round, but the last few days have been locked into June Gloom types of overcast days. This entry was posted in Artists, Event, Groups, Painterly, Purchasable - As Art Prints, Water. Bookmark the permalink.